Looking for .info about Cellhire? Cellhire has launched a new website focussed on the history of the business, what it does, where it has been and where it’s going in the future in terms of global events. The new www.cellhire.info site allows potential customers and partners to discover more about Cellhire’s success globally and to identify synergies with both past, present and future activities of the business. Visitors to the site are able to learn about the history of the company through an interactive timeline and the various global events that Cellhire has been part of through an interactive multimedia timeline. The new site addresses regions of the world that Cellhire is presently developing in to including South America. Businesses looking to develop mobile telecoms relationships for major upcoming events such as the FIFA 2014 World Cup and the 2016 Olympics in Rio, will be able to connect with the world leader in international mobile telecoms solutions through this one central location. The new site will profile Cellhire’s success as the business attends the world’s largest events over the coming years including the Sochi Winter Olympics in February 2014. For more information about Cellhire, please visit www.cellhire.info. Cellhire has today launched a new site centred around the history of the business, what it does, where it has been and where it’s going in terms of global events. 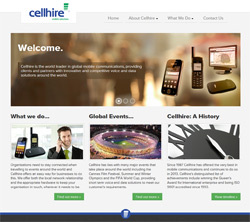 The new www.cellhire.info site allows potential partners and customers to find out more about Cellhire’s global success and to identify synergies with both past, present and future activities of the business. Visitors to the site can learn all about the history of Cellhire through an interactive timeline and the various global events the business has been part of through an interactive multimedia timeline. The new site is designed to address regions of the world where Cellhire is currently developing in to including South America. Businesses looking to develop mobile telecoms relationships for major upcoming events such as the FIFA 2014 World Cup and the 2016 Olympics in Rio, will be able to connect with the world leader in international mobile telecoms solutions through this one central location. The new site will change and develop to profile Cellhire’s success as the business attends the world’s largest events over the coming years including the Sochi Winter Olympics in February 2014. With iPhones being used more and more, whether for travel as an international cell phone or at home for everyday life, there is no denying that iPhones have become an essential part of life. Are you finding that your iPhone’s battery is constantly drained? Are you looking to improve its daily lifespan? Cellhire has a few tips and tricks to squeeze a little more juice out of your device. Disabling Push Email will give your iPhone a chance to rest, rather than waiting around for a new message. Sure, you may not receive the email a few seconds after it was sent, but if immediate delivery isn’t needed, you should set your iPhone to check mail servers less often. Now emails that you get on your iPhone will come in based on the global Fetch settings, instead of instantly. You can still hop into your Mail app to check them once in a while too. An added benefit of disabling Push Email is reducing your data usage, this can be especially helpful for international data roaming. Disabling Push Notifications will stop your iPhone from lighting up every time you have a notification, you probably don’t need notifications from the majority of apps. Another way to make this happen for all your apps is by turning on Do Not Disturb manually. 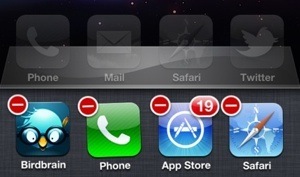 Clearing the Multitasking Queue so you don’t have an endless trail of open apps eating small amounts of battery life.